A tied last place with zero points, that was Austria’s result of the 2015 Eurovision Song Contest where they participated on homefield. Other countries have before them managed significantly better with half of all host countries ending in top 5. A few days ago we presented the top 5 over the worst scoring host countries, a list which featured this year’s Austrian participants as the absolute worst with no points at all. What they didn’t manage, plenty of others however did as half the times we find the host country scoring a top 5 position. A top 5 position is generally considered a really good result, so that is what we are looking at here: The host countries which scored themselves a place in top 5 on the final scoreboard. A total of five countries have won on homefield, including 1969 where the host country Spain became one of four winners. Ireland did it twice in a row, in 1993 and 1994. 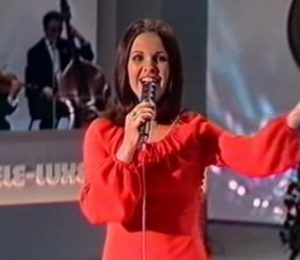 The best scoring host country was however Anne Marie David representing Luxembourg in 1973 who won with 129 points with a maximum of 160 possible, making them take home an impressive 80,63% of the points they with the system in use back then could have gotten. All three Scandinavian countries have ended in top 5 in a year they hosted it. The best scoring of those is Denmark which in 2001 came second in the contest held in their Capital Copenhagen with a percentages of 67,06% of the possible points and actually was leading the scoreboard at times. Though having had problems lately, the United Kingdom is the country that has most times ended second in the Eurovision history. Their best scoring second place on homefield came in 1972. UK hosted the show as the previous winning country, Monaco, was unable to – and in the contest held in Scotland, The New Seekers came second with the song Beg, Steal Or Borrow that scored a total of 67,06% of what they maximum could have got. Last time a host country ended in top 5 was in 2012 where Azerbaijan’s Sabina Babayeva came 4th scoring exactly half of the points available to her. For the percentage we have looked at the maximum points each country could receive in accordance to the voting system of that time.The different percentages can’t be compared without looking at the different voting systems. ← Is there something cooking up in Spain for Eurovision 2016?